Andy Hall salvaged a point for Glenavon in a 1-1 draw with Warrenpoint Town at Mourneview Park on Saturday. It may not have been the result the fans or players were looking for against the basement club, but after going behind on 21 seconds it was at least something to carry in to the Boxing Day derby against Portadown. Andy hall brought Glenavon level. Hall may have grabbed the goal, but man of the match was Jonny Tuffey who kept Glenavon in the game with a string of superb saves. Warrenpoint were gifted a goal in the first minute as Kris Lindsay was beaten by the bounce of the ball leaving Stephen Murray clear to run on and steer a shot past the advancing Jonny Tuffey. The fastest goal in the Irish League this season. The visitors continued to threaten on the counter using their pace to test Glenavon’s fragile back four. A chance to draw level fell to Eoin Bradley as the ball broke to him from a corner but his shot was blocked and when the rebound came out to Mark Sykes he lashed a shot over the bar. On 15 minutes an even better chance came when Joel Cooper whipped over a teasing cross and Rhys Marshall was one of three Glenavon players in the clear but his header flew inches over the bar. However Tuffey was forced to make two smart saves to keep out efforts on goal from Murray and Daniel Hughes. 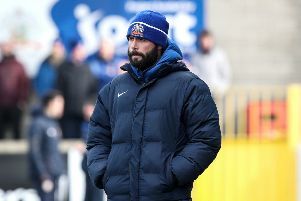 As Glenavon upped the pressure they had two big shouts for a penalty, first when Daniel Kearns was felled at the back post and then from a hand ball by Jordan Dane - both were waved away by referee Keith Kennedy. On 34 minutes Tuffey again was at his best to get down and gather a shot from Murray. The home side made a much better start to the second half and on 55 minutes they were level from a sublime effort from Andy Hall. After Cooper was felled outside the box, Hall curled the ball into the top corner with keeper Parr grasping at air. The goal certainly lifted Glenavon spirits and they went in search of the winner although still fearing a Warrenpoint counter. After Hall tried his luck again from a free kick in a similar postition which went straight to the keeper the visitors broke with Murray hitting the side netting. It continued to be end to end as both sides broke quickly but while the home side pressed they could not get that clean shot on goal. With six minutes to go Murray had a great chance to seal the win when he got in behind with only Tuffey to beat but the Glenavon stopper made another great save. Tuffey continued his heroics with another stunning save to deny Cliftonville bound Daniel Hughes two minutes later. Then right on 90 minutes the ball broke to Marshall a few yards out but he failed to connect and it ended all square. Glenavon: Tuffey, Neill, Kelly, Lindsay, Dillon, Marshall, Cooper, Bradley, Hall, Sykes, Kearns.